LeapFrog Scout's Build And Discover Tool Set Just $11.24 Down From $20! You are here: Home / Great Deals / Amazon Deals / LeapFrog Scout’s Build And Discover Tool Set Just $11.24 Down From $20! 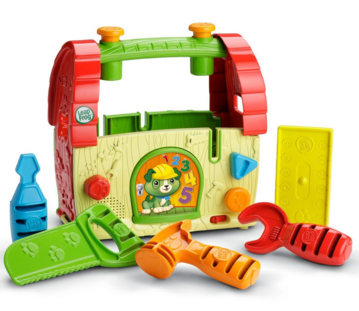 LeapFrog Scout’s Build And Discover Tool Set Just $11.24 Down From $20! Check out this fun Amazon deal. LeapFrog Scout’s Build And Discover Tool Set is just $11.24 down from $20! Get yours now while it lasts! Measure, tighten and hammer to build Scout a doghouse. Take it apart and do it again! Tool set includes 5 tools: a hammer, ruler, saw, screwdriver and wrench. Match colors to find the right tool for each job, count nails with Scout and more: the learning is built in! Teaches Building & Tinkering, Counting and Colors.